The Pennsylvania State University has space missions, dance marathons to fight cancer, football games with over 100,000 people in attendance, extremely high placement rates and the most delicious ice cream in existence. These opportunities are unlike any found at any other university. It’s one of the reasons I chose to attend this school. I take pride in my university because it gives its students so many amazing opportunities. But would I be happy about a university program sponsored by the Koch brothers at Penn State? That’s a difficult question. 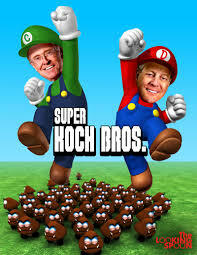 It’s no secret that the Koch brothers donate ridiculous amounts of money yearly to causes they deem to be appropriate. Government lobbying tends to be one of their favorite pastimes. Funding conservative political candidates is another. Compared to both of these highly polarized donations, when I heard the Koch brothers were giving money to educational institutions, my initial thought was, “That can’t be a bad thing. Education is education. It’s pure and bipartisan.” Then I thought about it a bit more. In our class this Wednesday, to which I was 45 minutes late (my apologies), President Barron discussed the sticky issue of accepting, or refusing, an endowment from the Koch brothers on the university level. He not only told us a story about his personal involvement with the Koch brothers and their donations to Florida State University, but he also exposed a problem in a unique way. Accepting outside money from donors with an agenda is acceptable if and only if the decision maintains academic integrity and freedom, is in the best interest of the students, is made by an elected body and if the donation increases the amount of opportunities and resources at the university. Dr. Barron’s decision seemed to reflect the values I formulated during our discussion/mentioned above and it is for that reason that I will agree with Dr. Barron. What I liked the most about class this week was the way he went about teaching us critical thinking. He was fair, unbiased and quite frankly a very thoughtful, kind and opportunistic thinker. I think I’m going to enjoy a class that is as open and free-speaking as ours is. As for the question of whether or not I would be happy about a university program sponsored by the Koch brothers at Penn State? My answer is: only if the program adheres to the criteria I listed above. As for this week’s featured image: who could resist?